It is still very much a work in progress, and the amount of content on the site will grow very rapidly over the next few months particularly as resources are added. It is the new front end for marketing of SawStop and Minimax machines (I Wood Like is an initiative of Gabbett Machinery, the importers of these tools), but it is to be a lot more than that, with it being a woodworking resource (not unlike Stu’s Shed in a way) covering the wider gamut of the woodworking genre. 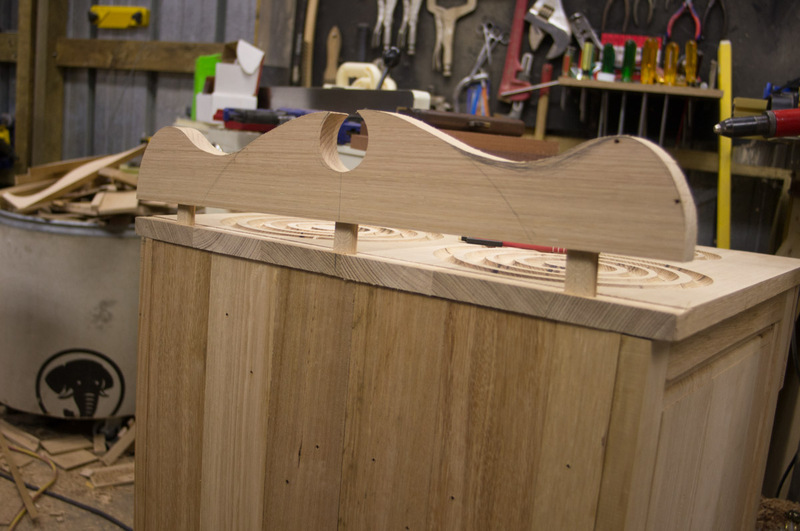 I’m going to be contributing a number of videos to the site as well, around the SawStop setup and use, including projects specifically using the SawStop tablesaw. I do see a number of sausages having close encounters with a spinning blade in the not-too distant future as well! Speaking of the SawStop Professional Tablesaw, I spoke with Matt today, and we have arranged for my SawStop (which has been sitting in their warehouse since October, waiting for me to have a shed to put it into!) to be delivered next Tuesday. It will come with a few spare test brakes, so there will be some sawblade destruction along with the sausage close encounters. There still isn’t a shed obviously, but with the proximity of Christmas, I didn’t want to risk of having the shed (finally), and not the saw! The kickstarter for this project came just over a month ago, and it has consumed a great deal of time and effort, but it is all worthwhile. And she is the reason why. Soon to turn 6, it was well overdue for her to have something significant out of the shed she loves visiting. With a combination of conflicting priorities, it was always going to be interesting to see how it came out. 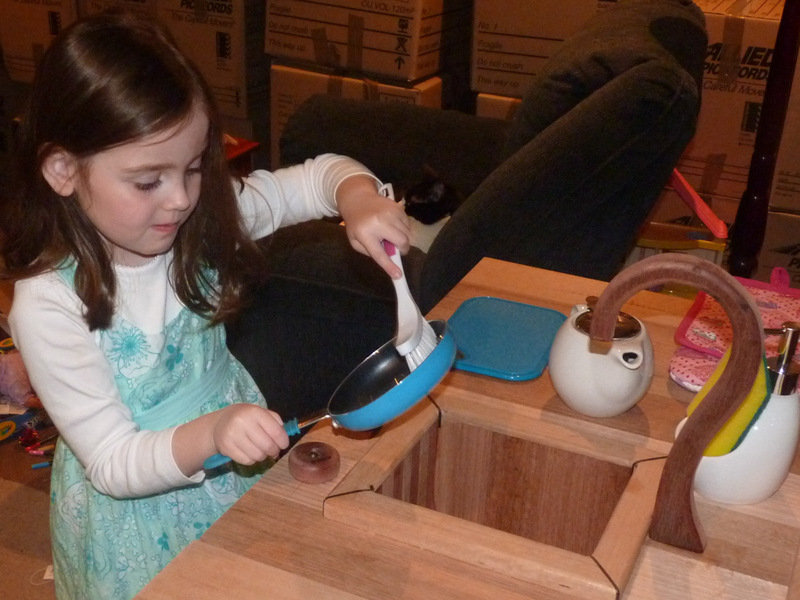 Short deadlines, a house purchase and a particularly busy work schedule all competed to derail the project, while making a great kitchen for my daughter, making the kitchen entirely from timber and having the experience of making two different toy kitchens before worked towards a decent result. 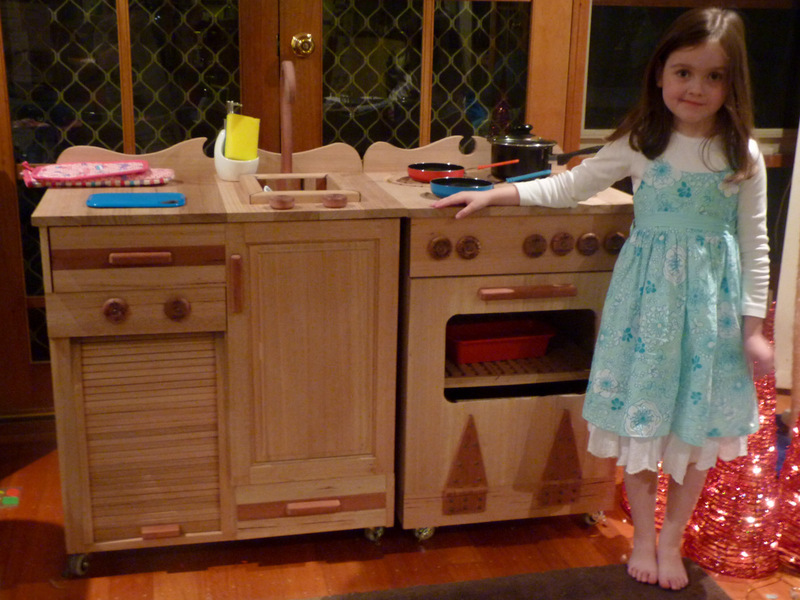 Especially wanting Jessie to have a kitchen that I’d made her. I’ve never finished a project so late (and during the build I knew it wouldn’t be fully complete, as far as being fully finished, so already had some compromises), nor have I had so many nicks and cuts from rushing around a shed that was quickly running out of space, and being pushed for time meant I wasn’t working to keep things as orderly as needed for a limited space, while splinters were common from the hardwood. The two large wrapped parcels hardly gained a second look during the morning, but there were tonnes of distractions in the form of wrapped parcels! 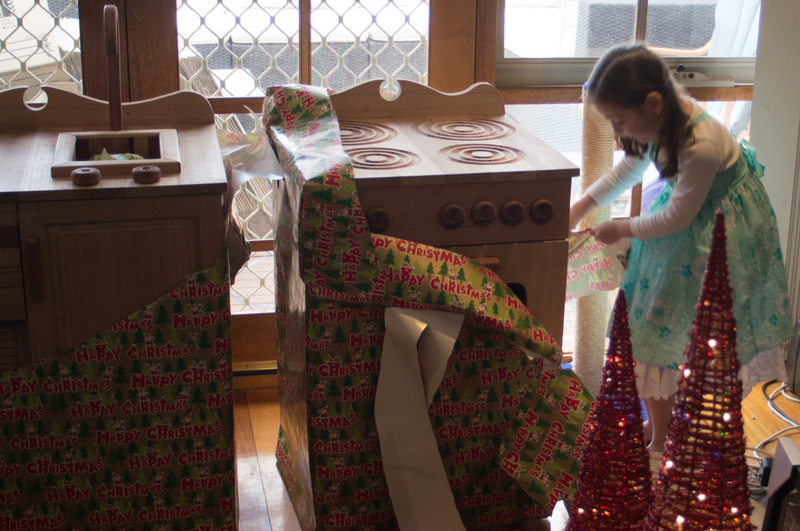 Finally, it was time for the reveal – two large, fully wrapped presents. It didn’t take long to reveal what was within, and it was pretty exciting! 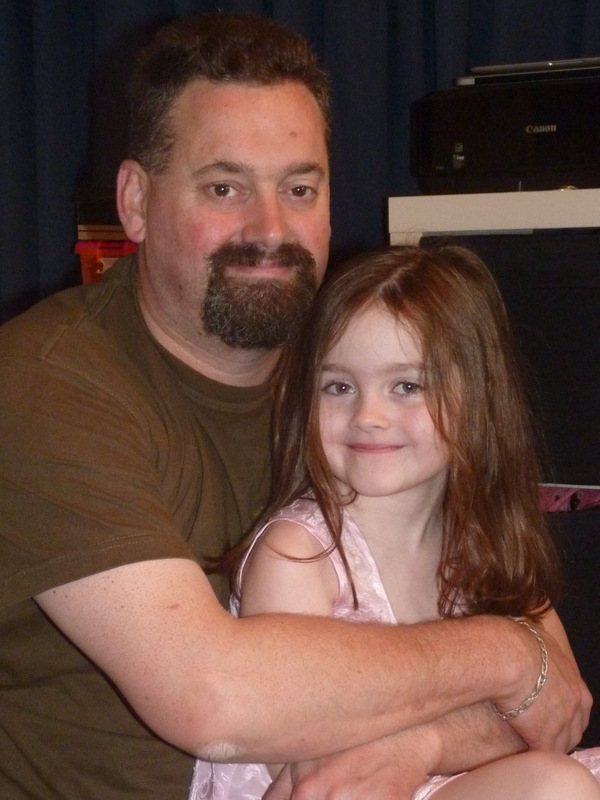 You cannot tell from the photos, but I can see the different expressions there, and can still hear the excited squeals. 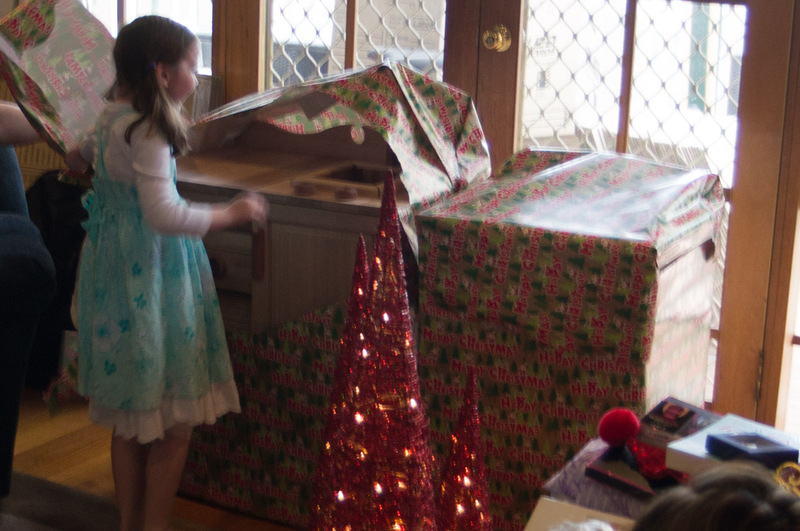 It did look very cool breaking through the wrapping paper. Once the main sheets of wrapping paper were removed, there was another surprise. 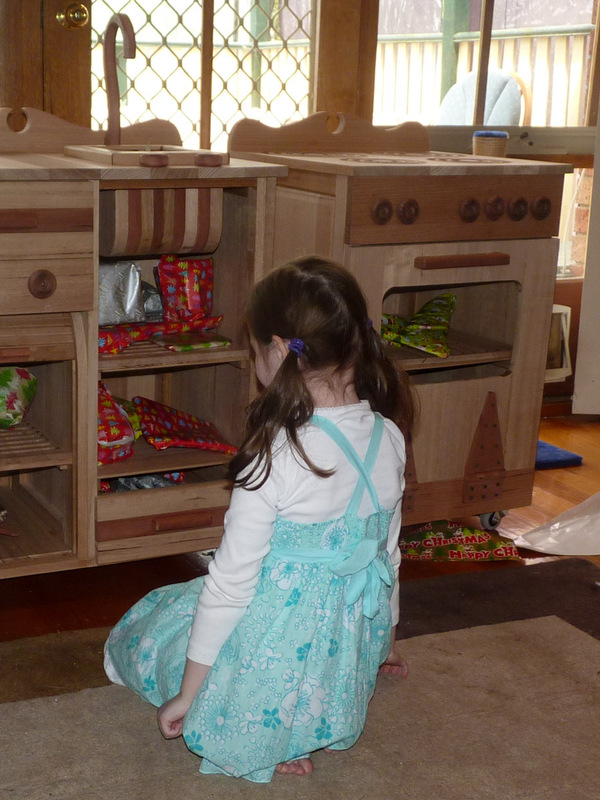 The units were packed full of more presents (and this after a morning of unwrapping). 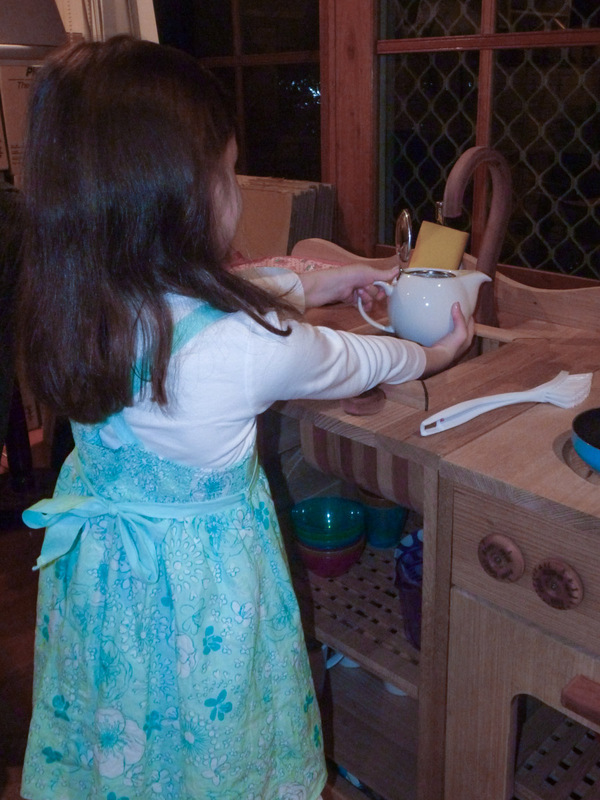 It was all the real tools of the trade- saucepans, cutlery, mashers, bowls, jugs etc. 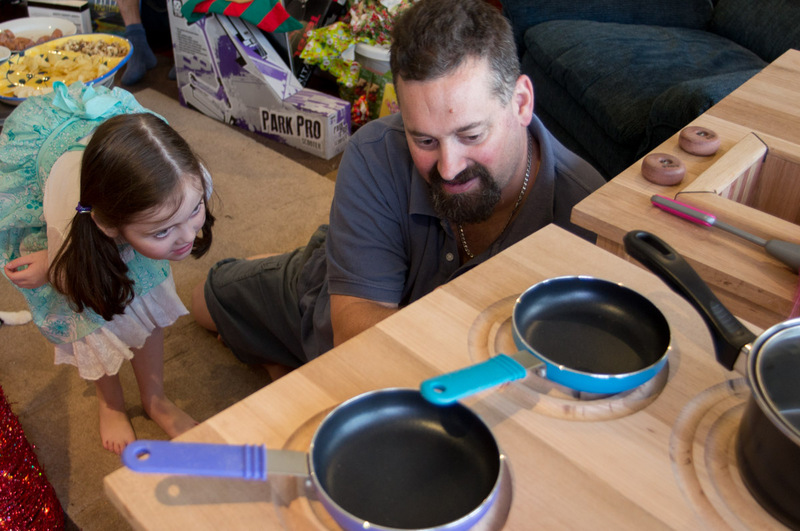 We had been shopping at Kmart a week earlier – they have a whole range of kitchenware, most with a $2 price tag. At the checkout, they fully expected us to be first-home buyers given the range of items in the cart. They are perfect – cheaper and better than any sold in toy sections, and that they are ‘real’ not ‘toy’ added to the experience during the reveal. 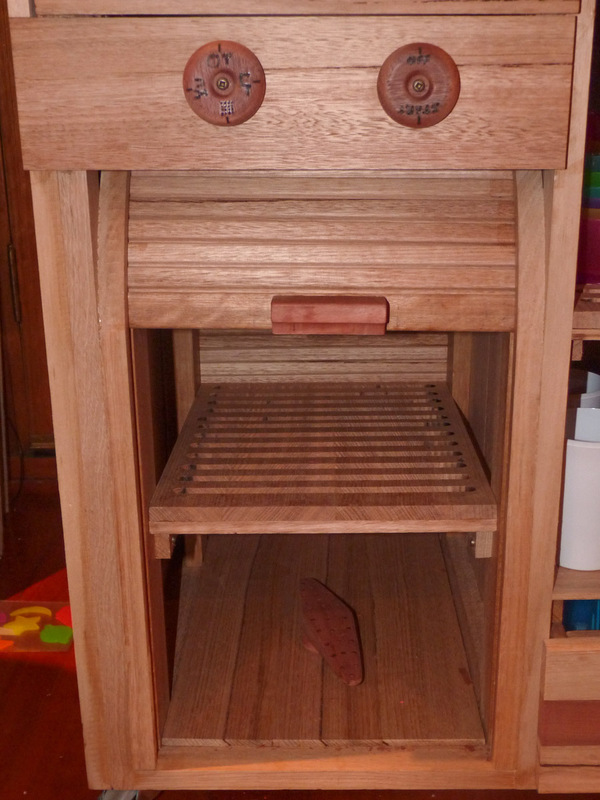 I’m very pleased how the units came out, and the small details of jarrah and redgum stood out against the quality of the Tassie Oak. I couldn’t help myself from pointing out some of the details I had included (mainly what each of the controls said, that I had burnt into the knobs with the pyrography set). Then it was a matter of sitting back and enjoying the soups, cupcakes etc that were being produced for the family. With playdoh food, the imagination play is endless. 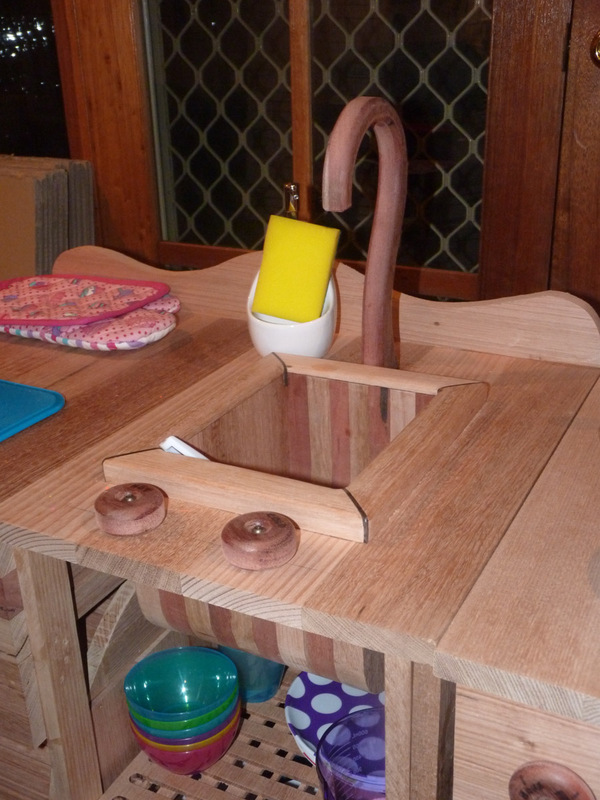 Some of the details then: the sink is laminated Tassie Oak and Redgum, as are the drawer fronts (with a jarrah handle). It is all glued, and in some cases also using Dominos. I avoided any metal fasteners until near the end, when it became obvious that it would be a significant compromise to continue with that ideal. That was when I first made some hinges for the oven, using wooden dowels, and that caused breakages. Once I had decided on brass hinge rods, then a few other places benefited from a minimal amount of metal. 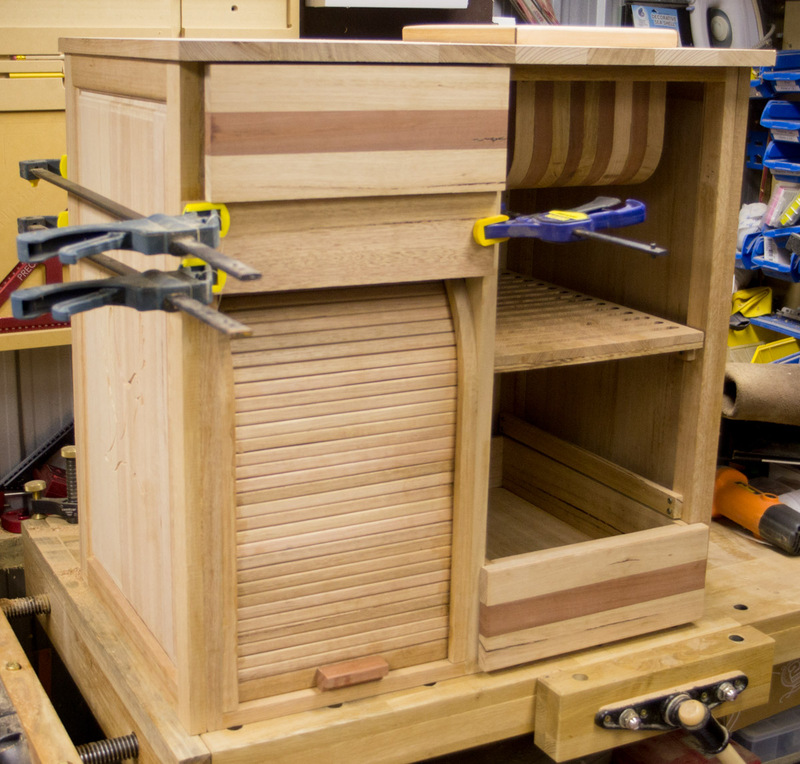 The drawers are dovetailed, the shelf a lattice, and the lower shelf using offcuts. In fact this project had less wastage from offcuts than I can remember seeing in a long time. There are hardly any at all, with wastage being small pieces assigned to the firewood bin, or are sawdust in the collection bag (and that is full). I went through two full bottles of glue – about a full litre of yellow PVA on this project. Again, the result of joining so many boards together to create the panels required. The Frontline clamps got a significant workout. The side panels each have a routed picture – one of the little surprises. 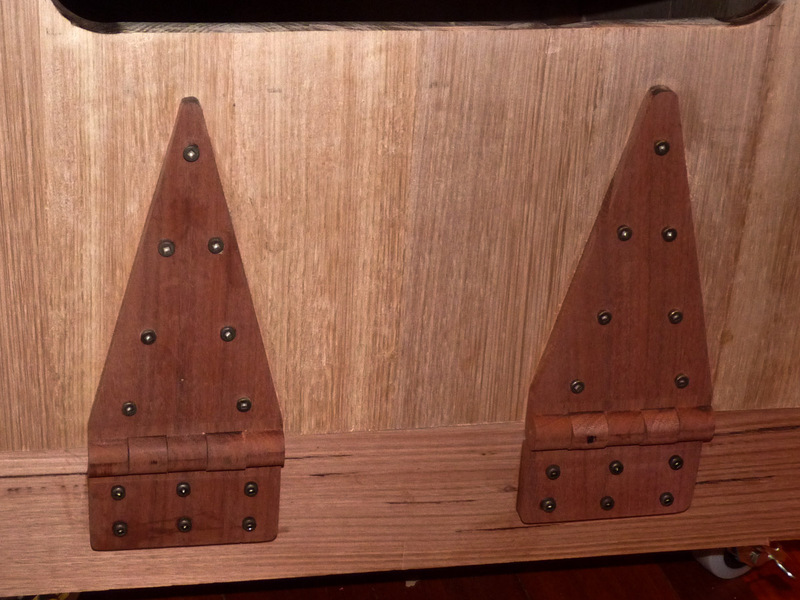 I love the strap hinges – they came up awesome! The Incra Hingecrafter was a significant asset. 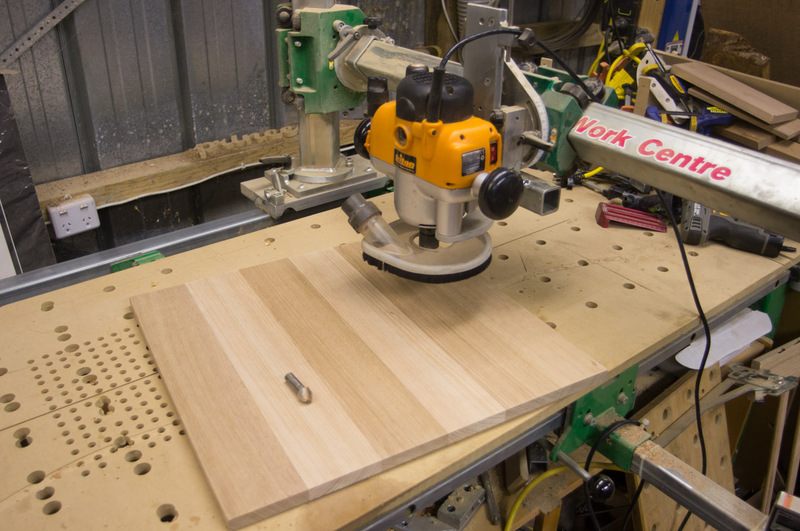 The Hingecrafter is not just the drilling jig, but also the box set of router bits that match. Being able to make your own hinges is a great feeling – you really come away ‘owning’ the project being able to make, rather than buy the accessories. About the only thing I purchased for this was the castor wheels. 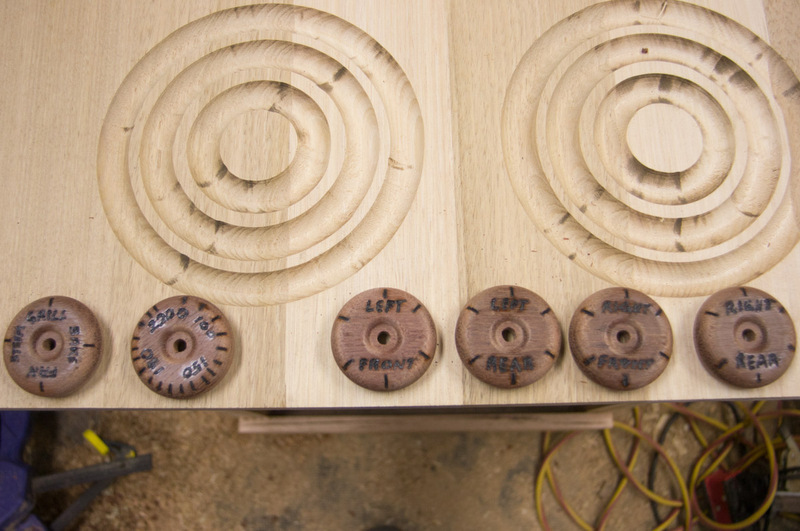 The toy wheels, repurposed as control knobs were supplemented with the pyrography kit burning in names, and values. 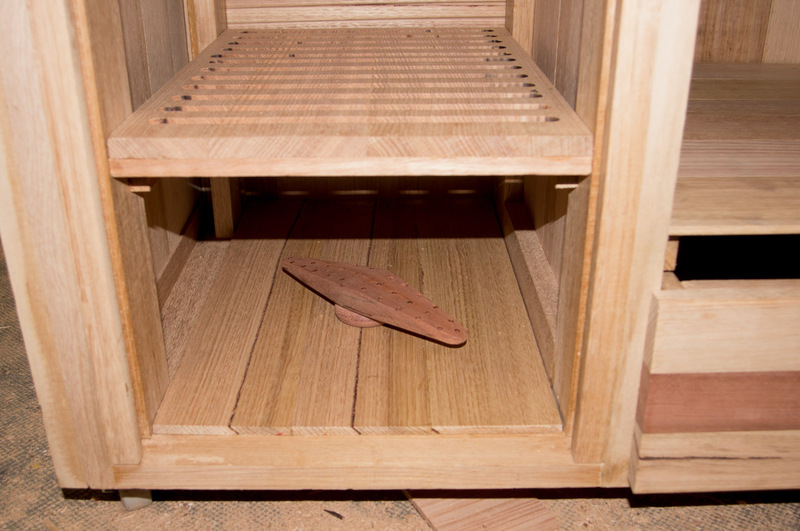 The hinges for the oven – very functional, strong, and compared to commercial hinges I have used before in the same situation, less likely to rip out of the timber as the load is distributed over a larger area. 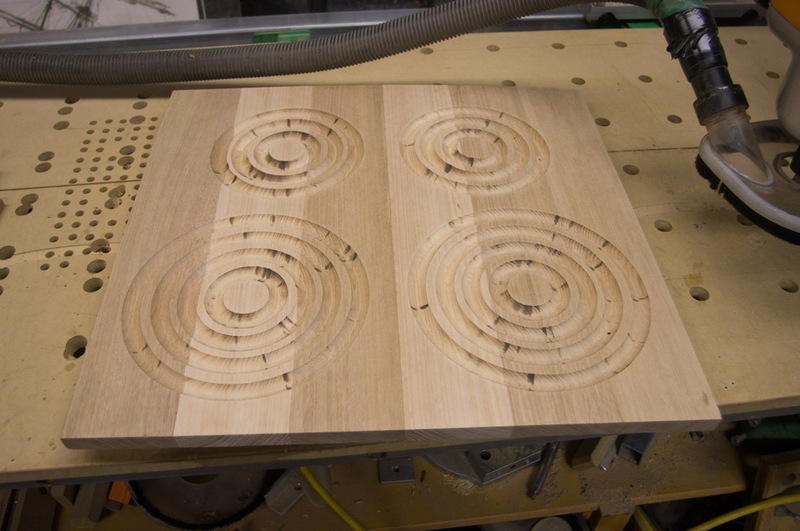 A bandsawn faucet (rounded over on the router table), and a couple of oversized wheels for taps made with a wheel cutter on the drill press. 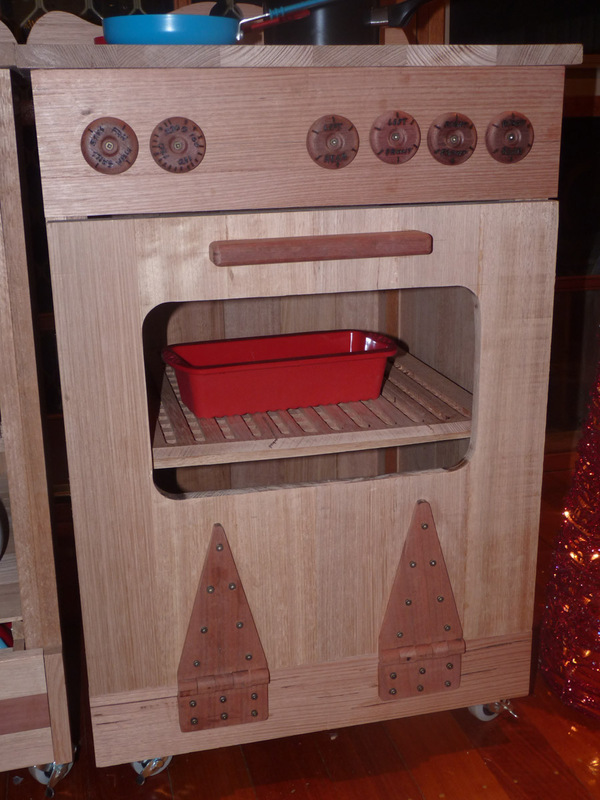 The tambour door looks the part, and I added a spinning nozzle to the base to complete the dishwasher. To finish this project off, I need to replace the hinges on the cupboard door (a short job with the hingecrafter), sand, roundover edges, and apply an oil finish. Even so, a very satisfactory conclusion to the project (or at least a major delivery point). Next, the kitchen needs a microwave, sandwich press, toaster (to start). A storage cupboard may be in order, and a fridge. The possibilities are endless. The 11th hour has come and gone, and now it is but a minute to midnight (figuratively). I really didn’t plan on spending so much of my birthday in the shed, but getting ready for my daughter’s Christmas has been the driving motivation since I started a month ago. Guess I should have started 2 months ago! So it is now a given – the kitchen will not be completely finished in time. That is not a surprise – for a long time I have been fully expecting that, but it was an interesting matter of just how close I would get. The first kitchen I made (not a dissimilar general look) took about a weekend. (10-12 hours). This one has taken a little longer – in the order of 30 hours (very roughly) to date, and I’d expect there is another 6-8 hours of work to go. Lots of detail in this one, no plans, and the design created on the fly (and modified on the fly as well to deal with various challenges, and time constraints). No photos tonight – all will be in the Christmas day reveal. Anyone else been making things for Christmas? (Toys or otherwise). Been a hard slog for the past few weeks – work has a massive deadline approaching in the new year (like Jan 2!). There is a lot of bitsy stuff associated with buying a new place which has been eating time, and although I need to get the place ready as well, that part will have to wait another week or so. At the same time, I have been scraping together every minute I can find to finish the kitchen project in time for Christmas. The problem has been that a lot of the time I can find has been late at night, and I just can’t fire up the big machines. So progress has not been as fast as I’d want. Now, well, we are right on Xmas and I still have a little way to go. But every day a lot closer, and today was no exception. Just before gluing on the back to the sink unit, I took one last photo. 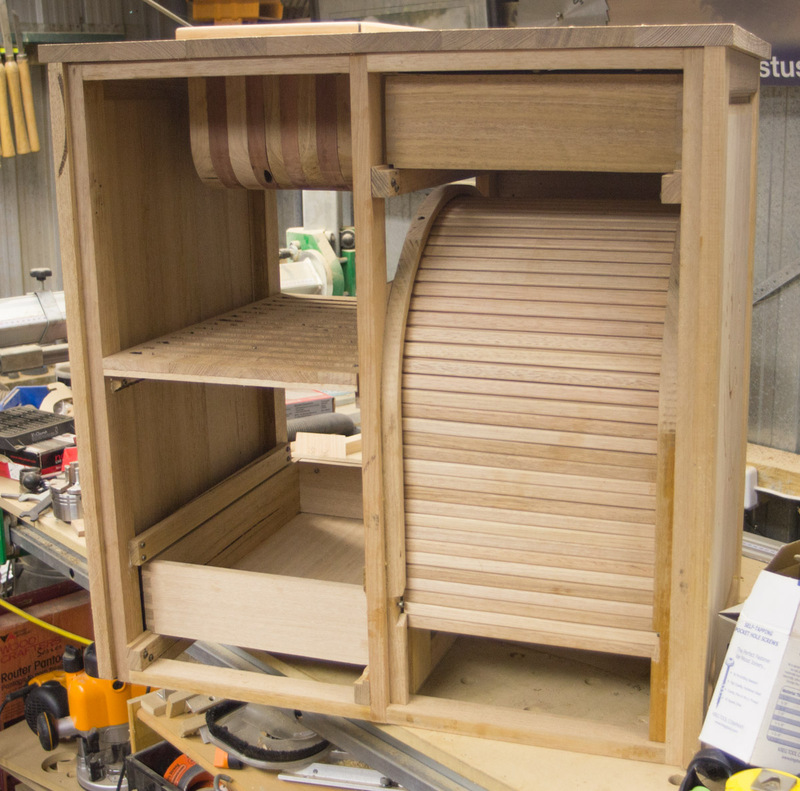 You can see the dovetail drawers, the laminated sink, and the tambour, which includes an access point. It has also been a great opportunity to put the Festool CXS though its paces in an environment it was designed for – internal cabinetry. That right angle adapter has been brilliant, as has it size, and the interchangeable heads. While checking the link, also noticed it is still on special. Anyone stuck for last minute Xmas present ideas? From the front, and things are changing minute by minute. After getting some kitchenware to go with the new units, I found that the one drawer was not enough, so came up with a plan to use the second drawer I had made (and abandoned because I had forgotten about the sink). So that was a much better outcome. It has been a while since I used the Torque Workcentre – haven’t needed it for the current project, until now. 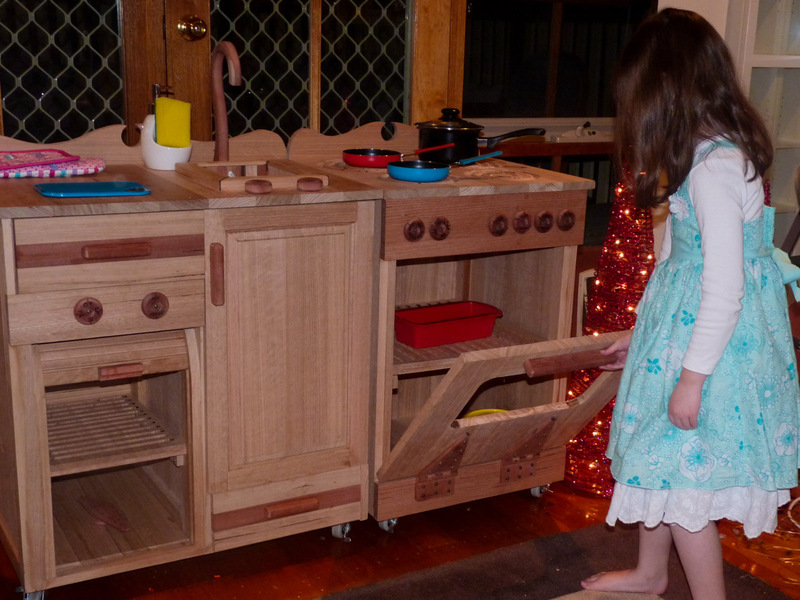 The very first job I did on the TWC was to create stove elements for another couple of toy kitchens I was making at the time, and today was the day to get it dusty again (as in its own dust, not thrown from other machines!) With a hole underneath for each element, and a cove bit mounted, the router was plunged and locked. 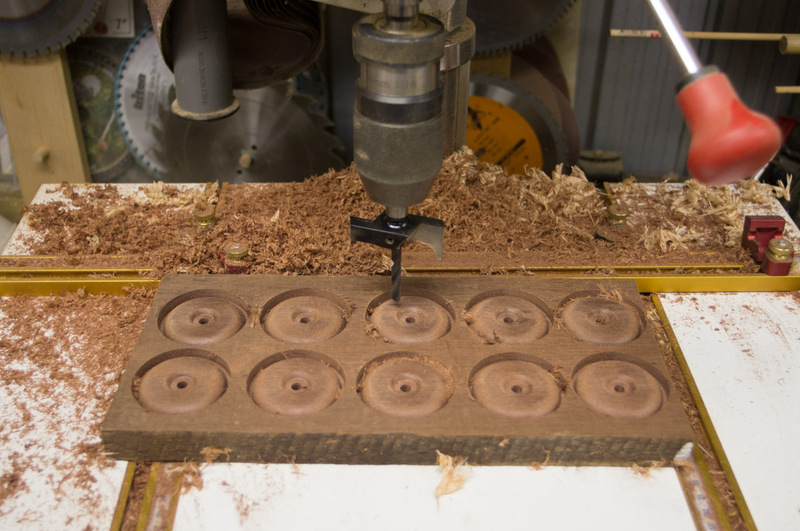 I then rotated the workpiece under the router, creating each circle. A bit nervewracking – I could ill-afford any errors, but the result speaks for itself. So that was then attached to the base. Not sure where I got the form from- probably my parents’ old stove which was electric (as is quite the norm in power). Doesn’t matter the source. 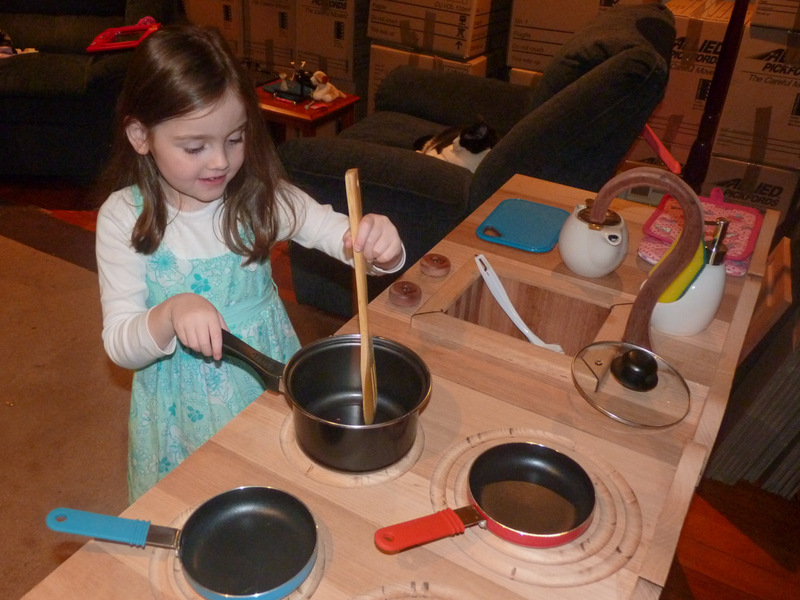 This way users can clearly see where the stove is, and yet the top is flush if some play activity needs a larger area. I decided that the units needed something visual to stop the eye looking at, and then past the units. So a barrier was needed at the back to provide this visual stop. 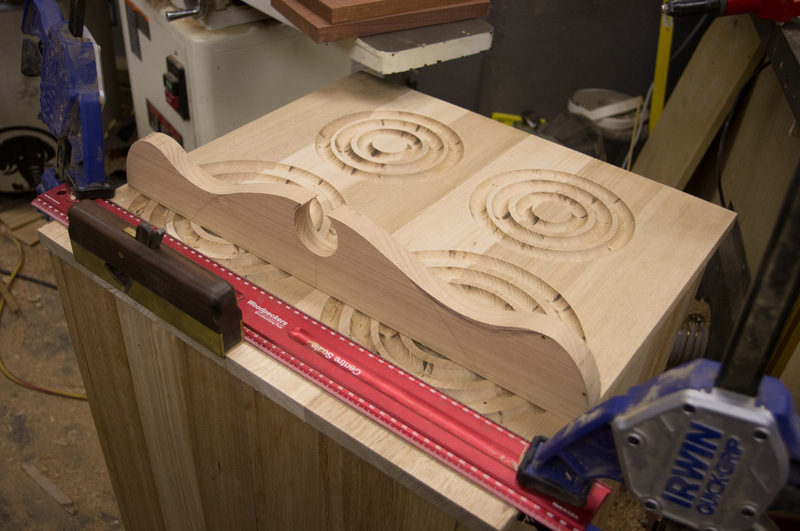 Using a combination of bandsaw and spindle sander made it easy to create this form. The top was not as flat as it should, so I needed to correct that. Rather than trying to do so for the entire top, I decided to flatten only the area that was actually important. 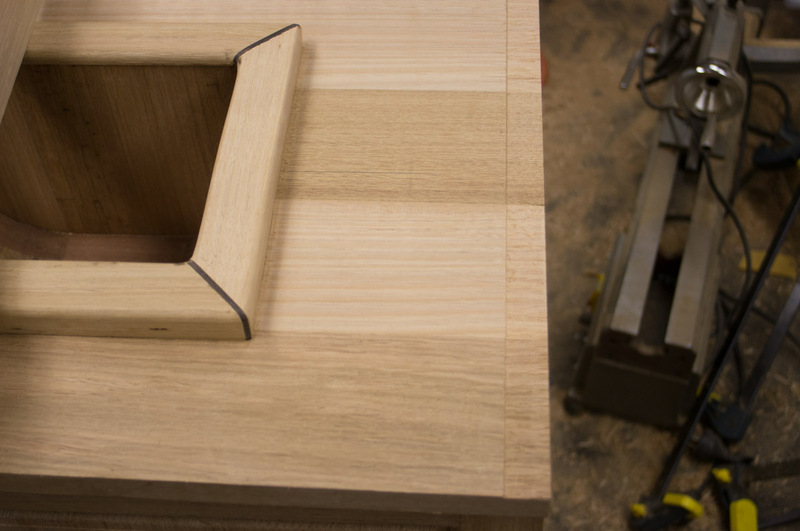 Clamping down a straight edge, the HNT shoulder plane one again proved how useful it is. I find it great for tidying up drawers (in situ), and for tasks such as this. To ensure the security of the backing, I used dominos. So that worked a treat, and the backs got secured in place. An offcut of Jarrah was my next victim. I needed a bunch of wheels, so punching then out all at one from the single piece was the order of the day. 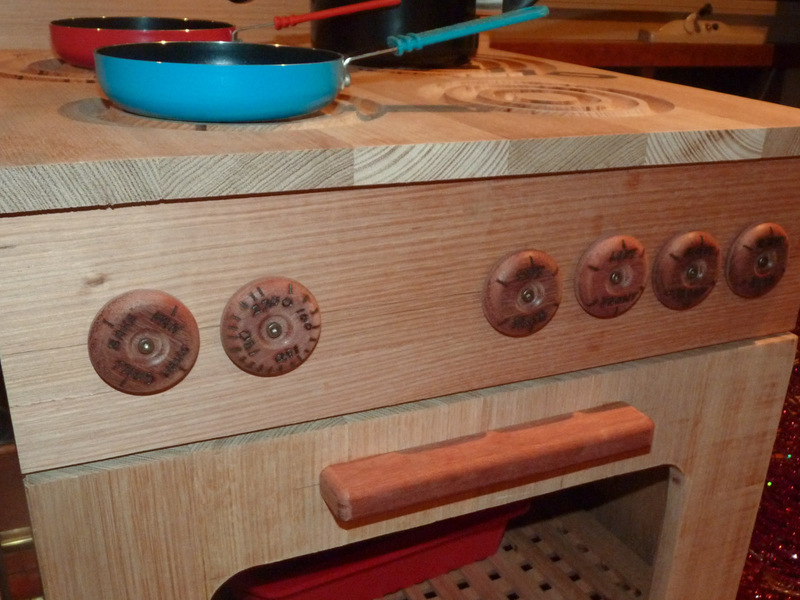 With the aid of my woodburner, this set of wheels became the much needed knobs. Stove controls, oven controls, dishwasher, taps. I like the idea that wooden wheels can be repurposed this way. The project is coming down to final details – the value-add. 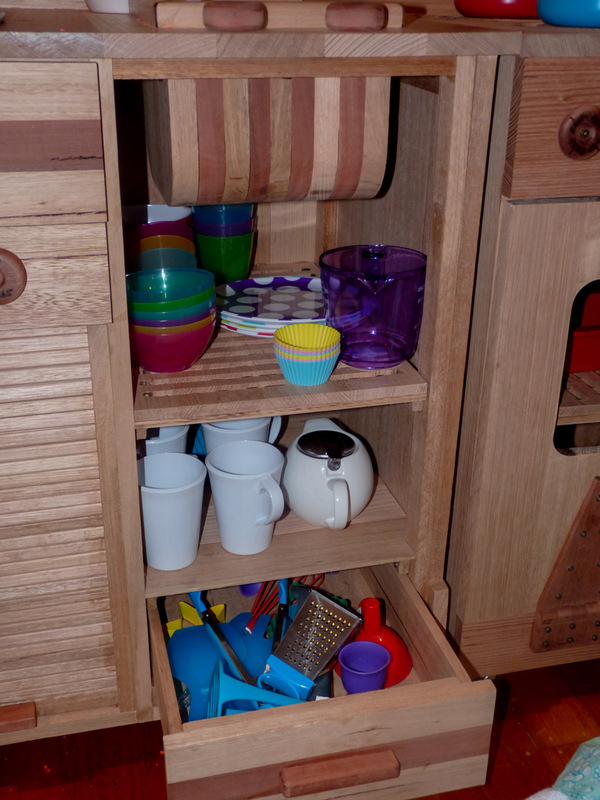 Little features like the knobs, taps, shelves, drawer dividers etc. And in this case, a swing arm / sprayer for the dishwasher. If I had more time, more ideas would present themselves that could really bring the unit to life. So the final push tomorrow, just in time for Christmas. I need a couple of doors, a couple of wooden hinges, and then sanding, sanding, sanding. I’ll apply a finish later – that would definitely take time. Next time I hope to be presenting the completed units, with a closer look at details. I found a phone the other day – sadly the owner had lost it, and it had subsequently been run over as well (not a happy phone!) To have a look at the contact list to find the owner, I had to dig up an old phone to put the SIM into and in my diggings I found my first digital mobile that I had while still in the Navy, and had last used in 1998. (the AA battery I included for scale). 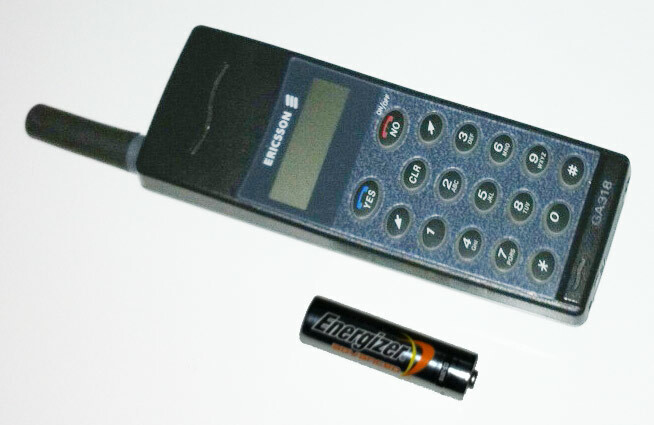 When I went to charge it, I was stunned to find that not only the phone still worked (that was pretty much expected), but that it still retained about 3/4 of its charge. After 14 years!!!! We retire these tools with scary regularity, to replace them with the latest and greatest. The newest ones do have all sorts of amazing features, they are smaller, smarter, play more games, and have become mini-computers. But what is a phone really for? It still works, and is (although tiring) capable of everything it was valued for when it was new. 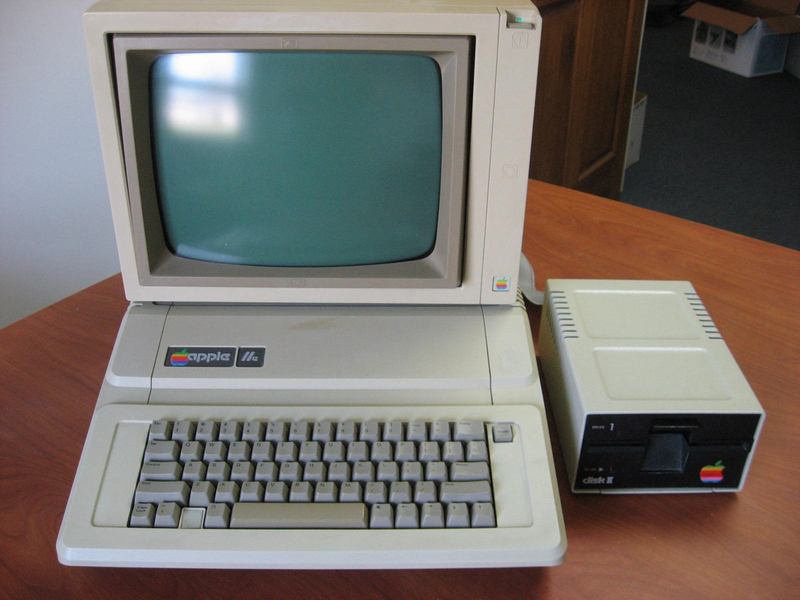 Still capable of word processing, spreadsheets, and still has some great games. What I am trying to show is although there are some things to gain from getting the latest and greatest of anything, the items that are left behind are still perfectly capable of doing what they were intended to do, even in a market a volatile as computing, or mobile telephony. (And I am as much an enthusiastic consumer of the latest and greatest techno-gadgets as anyone). So what about in woodworking? Such a volatile market indeed, it is hard to keep up. All those new hammers, tablesaws, and ruler technology. It is still worth remembering that despite all the ‘advancements’, very few reflect a real improvement, a true redesign rather than just a fad to generate sales. We’ve seen a few: lasers on tools (even on handsaws ffs), magnesium casings, snake oil salesmen at wood shows, and all their wares. Think back to how artisans of old managed to produce the most stunning of work, with the most basic of tools. Some of what we buy is to fasttrack the process of being able to produce equivalent work without the days, months and years of practice, finessing the craft. Some of what we buy turns out to be snake oil. That is not to say there hasn’t been some inventions in recent times that have really added to the woodworking world. Some of the things produced by Bridge City certainly would count, the SawStop and Incra both definitely rate, or going back a few years now, some of the stuff Teknatool came up with to revolutionise workholding on the lathe. Others are redesigning and reworking existing products, such as Woodpeckers, and they are producing beautifully refined tools. But there is still a group who are quite prepared to take a laser, stick it on a hammer (or a saw) in the hopes to deprive you of your hard-earned without actually providing a real benefit. Back to the phone again, and what it made me think of when I saw it (and how functional it has remained). It is worth having a look through your workshop, see what has been pushed aside because of upgrades, refinements, space constraints or whatever. You may well (re)discover some treasures out there. I found some tools recently I had completely forgotten I even owned. Nothing wrong with the tool, or its functionality, or why it was purchased. Just lost in time. The benefit of buying quality: it remains a quality item for many years past when lesser examples have long fallen by the wayside. 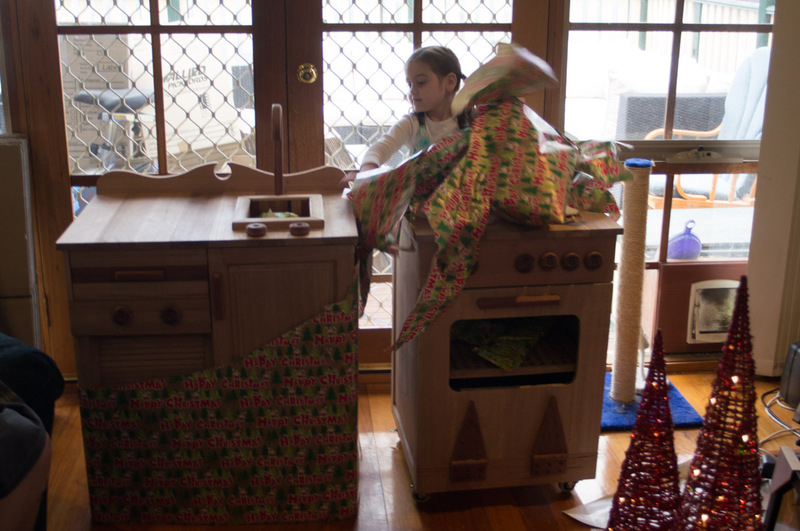 So I hope that you find under your Christmas trees some new, functional, quality additions to your workshops. But don’t forget you already have an awesome tool already, just waiting for you to pick it up and yield it: your existing shed, and all the tools contained therein. Imagine an artisan of old walking in there and falling over in amazement at what we now have at our disposal, and what they could achieve with them. And yes, I did track down the phone owner, from the number on the SIM card. Who wants that sort of hassle, especially at Christmas time? Had another guest around the other night to have a look at my Torque Workcentre. It’s always fun slowly winding up the demo, getting them off guard, then smack em with capability after capability, feature after feature. There is a particular look they get when they start taking what they have seen and start coming up with their own solutions to problems they didn’t realise existed, until the solution was thrust in front of them! It’s always fun demonstrating a machine that actually justifies the interest. And being able to say that no, I’m not trying to sell a machine by doing this demo – I have no vested interest in whether you buy one or not. But I know after I’ve demo’ed it to you, I know you’ll get one anyway! Other than that, I really haven’t been able to get out to the shed recently – for some people, it is a winding-down time approaching Christmas. Mine is the opposite, and I basically fall across the finish line at the end.